In 1947, after serving in WWII, Paul S. Stovall, Sr. established Stovall Mower and Cycle behind his home on Dodson Drive in Atlanta, selling small air-cooled engine products and bicycles. 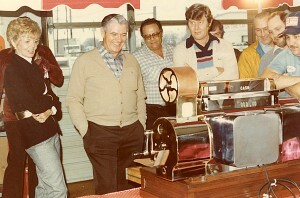 After moving to a facility on Bankhead Highway and incorporating in 1957 and changing the name to Stovall and Company, Inc., the company continued retail sales, but also expanded into industrial air compressors and the distribution of leading power equipment lines such as Snapper and Weed Eater. Over the next 30 years Stovall grew these divisions and expanded from a single store in Atlanta to multiple locations around the city. The 1990s brought additional growth and change for Stovall with expansion into the golf equipment, golf irrigation and turf irrigation fields, doubling the size of the company. In the early 2000s, Stovall began to adjust focus from equipment to the green industry exclusively with the addition of wholesale nurseries to the product mix. Today, Stovall is proud to supply nursery products, irrigation supplies and hardscape materials to the landscape industry, with convenient locations across North Georgia. With over 65 years of experience as a family owned business, Stovall has a proven ability to grow and adapt with a changing marketplace and offer quality materials and service to an ever expanding industry. ©2007 - 2014 Stovall & Company, Inc.